Need a menu idea? Yesterday, at our regular Sunday dinner at Mom’s, we ate extra meaty baby back ribs. I did not feel like breaking out every pan in the kitchen to come up with a special meal. So, what could be easier than buying a disposable foil pan and preparing ribs? The rib dinner is not French or Pennsylvania Dutch. There is no actual recipe but … I can describe how I prepared it (click on the link in the table of contents) but this meal came together literally off the top of my head as I walked through the grocery store making last-minute purchases to stock up Mom’s fridge for the week. There is nothing extravagant about this dinner. I did not need any fancy spices or specialty cookware. I made it simple for easy cleanup. 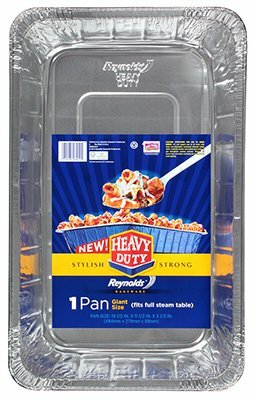 A large foil disposable foil pan so the ribs can lay flat and heavy duty aluminum foil to seal the pan tightly. If there are any leftovers, just re-seal and carry home. The flavors can easily be changed to accommodate different vegetables but sometimes, simple is best. Especially when the ribs are extra meaty. I’ll be adding variations of this simple menu in the comments section. Preparing ribs this way would also work well with shredded cabbage, sautéed Brussels sprouts or that tasty and colorful combination of mixed shredded vegetables (vegetable spaghetti) sold by Wegmans®. Sometimes it’s not about the barbecue sauce. Mix it up and surprise the family! Do you have a favorite spice blend? 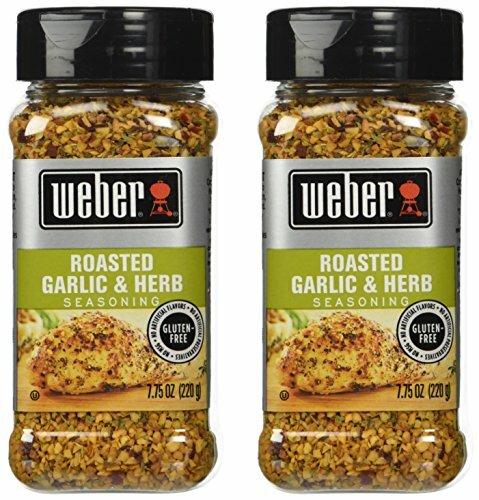 I am surprised at how often I reach for Weber® Roasted Garlic & Herbs seasoning. Try it on chicken but it is an incredible combination of herbs and spices that works magic on pork roast, pork chops and ribs. Low in sodium (90 mg), this spice blend is also gluten free. The label only mentions salt and red pepper flakes but does not list the herb used in the blend. Season these extra meaty baby back ribs, cover them with foil and walk away. That’s all there is to it. Come back a few hours later to fall off the bone tender meat and delicious pan juices. Sprinkle the diced celery and onions evenly across the bottom of the pan. Place the ribs top side down on the diced celery and onions, exposing the back of the ribs. Press down into the diced vegetables. Season to taste. Flip the ribs over and season to taste. Seal the pan tightly with a length of aluminum foil and gently press down along the inside rim of the pan creating a little depression all along the edges. You want the steam created during the cooking process to drip back down into the pan. Make sure the edges are tightly sealed all the way around. Place in a 350 degree preheated oven and cook for 2.5 hours without peaking. Remove a section of the foil and baste the ribs with the pan juices. Re-seal the pan and place back in the oven while you prepare the sides – about 30 to 45 minutes more. 15 minutes before serving dinner, remove the foil from the pan and reset the oven to broil or convection at 350* but just long enough to brown the top of the ribs. You do not want to dry them out or burn the meat. Just give them some color. I did not even need a knife to make servings. I just flipped over one end of the rack and the ribs came apart at the fold – approximately 4 ribs from the end of the rack. Continue folding until you have several servings. 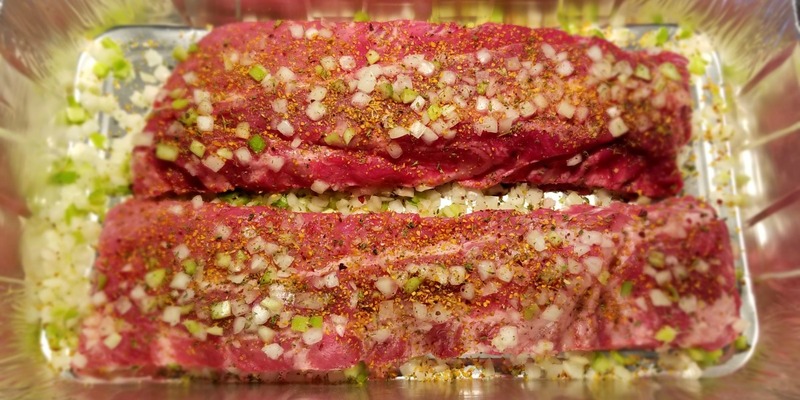 Use a knife to cut servings of individual ribs. How long to cook extra meaty baby back ribs? What’s the trick to keeping these ribs super moist and juicy yet still fall off the bone tender? Cook the ribs just long enough – always tightly sealed in foil (allow 2.5 to 3 hours depending on the total weight) and then roast them uncovered for about 15 minutes to brown the surface. Ever tried to roast a large piece of meat and found, half way through the cooking process, that it would be nice to have some wiggle room in the pan? Maybe for vegetables, maybe to reach into the bottom of the pan to fill a large spoon with pan juices to baste the meat? When preparing racks of ribs, I always go for the heavy duty foil pans. I like to buy them as large as will fit in the oven so that I can roast potatoes and vegetables along with the meat. A larger pan also allows the meat to roast on all sides rather than just the top. 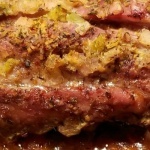 Place the ribs too close to each other and they will “stew” rather than roast. Who wants grey ribs? Not I! Pick a foil pan that will fit your piece of meat yet give you plenty of room around the meat. It works, I promise. The meat produces tasty pan juices but if needed, you can add a cup of water or chicken broth to deglaze the bottom of the roasting pan during the final 15 minutes. The last thing you want to do at this point is burn any part of the ribs or burn the pan juices. Serve the “gravy” with the ribs. I’m Not Cooking Competition Ribs! Nothing special about the ribs either. These are not competition grade ribs! Just regular Smithfield© extra meaty baby back ribs (not the St.Louis style spare ribs). Try this same cooking method with beef ribs (not short ribs but short rib racks that look exactly like baby back pork ribs) and you’ll wonder why you don’t prepare them more often. Same seasoning, same method. Equally delicious. You know me by now. I tend to prepare whatever I find. Force of habit dating back to years of buying whatever food was available that day aka just a step above living off the land in third world countries. My favorite pastime then was to read old cookbooks and dream of what I could prepare if only I had the ingredients. I still read cookbooks and recipes but I rarely if ever follow them to the letter. Most of the time, I just make them up as I go. This recipe is a good example of cooking without a recipe. Trust your taste buds. 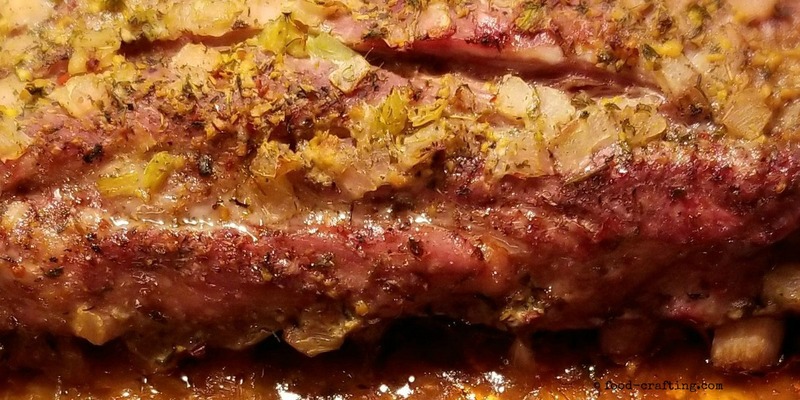 Braised Country Style Pork Ribs: Super Easy Recipe For Tonight’s Dinner! 4 I’m Not Cooking Competition Ribs! Game Day Menu Recipes: Most Popular Easy Super Bowl Food! Here are a couple menu ideas to complement the ribs. I normally buy a variety of vegetables and “sides” to give Mom an opportunity to select what she would like with Sunday dinner but also what she would like to have during the rest of the week. Her strict diet does not allow her to veer too far off the diet but once a week, I do allow her a few exceptions to the rules. She loves French Fries. Excusez-moi – des frites. Not because she is French but because fries just go with certain meats – steak frites, ribs frites, andouillettes frites… you get the idea 🙂 Très French. Silly me to think that I could get this one past her > sweet potato fries. Wegmans© is featuring veggie fries. Great idea. I would prepare them in a heart beat to have with grilled pork chops, plain or barbecued ribs. Nice change. Toss them in olive oil and sprinkle with Mediterranean seasonings. Roast in the oven – with the ribs! This Sunday, Mom asked for saffron rice. Saffron rice kicked up several notches with a side of steamed broccoli and a huge salade verte. 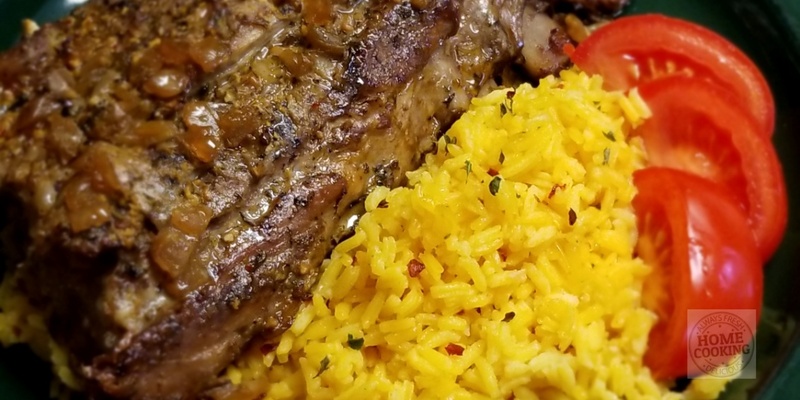 What would you serve with the ribs? Look forward to your suggestions!